ReadM is a reader for electronic books, which supports a variety of popular text and audio formats, including Aportis DOC, TCR, and MP3. Plain text files inside GZIP (not ZIP) archives are also supported. You can download books via infrared, Bluetooth, or Internet connection. The books you download could also be shared with other mobile devices and beamed through infrared or Bluetooth, or send with e-mail or MMS. ReadM can be used as an embedded viewer for compatible formats in e-mail attachments, MMS, or WAP pages. 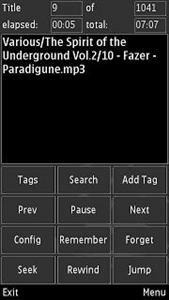 You can also playback any MP3 music files with ReadM (MPEG Audio Layer 3 versions 1, 2 and 2.5 are supported.). Bookmarks, highlights, annotations, and text corrections. Portrait and landscape text orientation. Backlight timeout control for text view. Global and per book settings.